The conference, under the theme “Promoting cross border peace and social cohesion”, brought together youth, women, intellectuals, traditional leaders, government officials, religious leaders and civil society activists. Manyang Mading, on behalf of the cattle camp youth known locally as Gel-Weng, emphasized that it is imperative to hold perpetrators of crimes accountable and hopes the establishment of a joint court will make that happen. Gel-Weng is a Dinka word that literally means “to protect cows” from potential raiders. “Setting up a joint court will reinstate stability and rule of law between our communities. For so long, our people have suffered because of impunity,” he said. “We have suffered a lot as mothers, sisters and wives. This conflict has robbed our community of basic human rights. Women and girls are being raped and even killed,” she stated. Parents of the three school girls who died last week on fire incident have blamed the administration of Silesians’ Don Bosco School in Tonj State for not protecting their children. The three girls died on a fire incident that started when they were asleep in their school dormitory. The cause of the fire remains unclear. In an interview on phone from Tonj State yesterday, acting Minister of Information, Deng Madut Deng said the committee has been formed to investigate the incident and it came back from the site after the fact findings. He said the committee has recommended for compensation of girls according to Wathalel Customer Law. “Wathalel customary law says for the loss of one person, the culprit must pay 31 cows to the families of the late,” he said. Madut said the committee agreed that the government will compensate two girls by giving out cows while Don Bosco administration will compensate one girl. “Both the government and missionary agreed to pay compensation to the families of the deceased,” Madut said. He added that the State government told families of the deceased that missionaries play important role in the community. “We cannot blame them because they are not the one who caused the fire. Their mission is to educate all students with a focus of ensuring that girls have equal access to education,” Madut added. Don Bosco is operating as primary and secondary schools, as well as medical clinics in some parts of the country. Minster Madut told Juba Monitor that the administration of Silesians’ Don Bosco apologised to the families of the deceased who died on the fire incident. Madut revealed that the incident was the first in the State since it was created in 2015. The head coach of South Sudan’s U-23 team, Simon James Yor is optimistic about the national team’s junior squad. Upon return from Tunisia where they the Junior Bright Stars put up nationalistic spirited fight despite 1-0 defeat, Coach Simon asked the South Sudan Football Association to keep an eye on the boys as they will be the future of this country. “There is a bright future for South Sudan football if the junior team is kept together,” Coach Yor said upon return from Tunis. “This team has proved that we have the potential to get better. We eliminated Uganda and lost to Tunisia by a small margin,” he added. Francis Amin Michael, the President of SSFA said they will promote the junior players to the senior team to strengthen the squad ahead of the next nation’s cup finals qualifiers. “We shall actually push some of these U-23 players to the senior team because they have showed that they can compete,” President Amin said. The U-23 team received a warm welcome at Juba International Airport upon returned home on Tuesday afternoon despite being knocked out of the 2019 Afocn U-23 and Tokyo 2020 Olympic games qualifications. The SSFA President and other government staff were among the officials and members of the public who cheered the team at the airport on Tuesday. 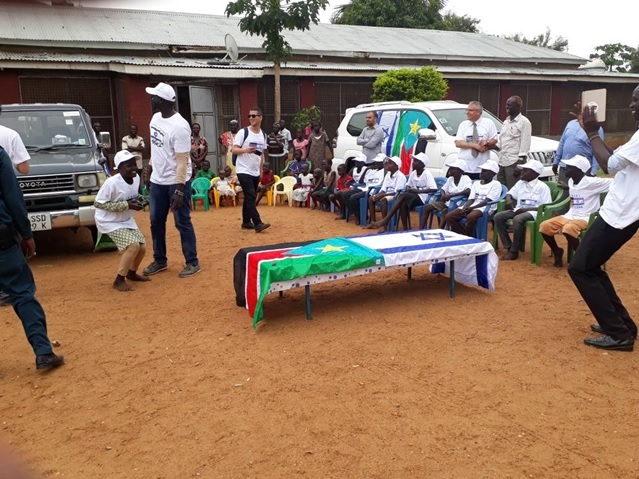 South Sudan U-23 team resurrected and rekindled hopes in the struggle to unite the country after five years civil war left the nation divided on various factors. Since beating Uganda 2-1 on aggregate last year and drawing 0-0 with the much experienced Tunisian team in Juba last week, the junior Bright Stars restored love and tranquility among South Sudanese citizens despite being knocked out in the return leg at the Ben Gardane Stadium last weekend in Tunis, Tunisia. The one day visit was for both leaders from the principal parties to peace agreement to see how they could come together with civil population as they prepare to conduct the rally in the coming days. Speaking to Juba Monitor on phone yesterday, Southern Liech Minister of Information and Culture, Nyuon Joseph confirmed that a team comprising of Northern Liech state Governor Joseph Nguen Monytuil and Opposition Governor Tongor Sudan the People Liberation Army in Opposition [SPLA-IO] whowere received by Stephen Teker Riak Dong governor of Southern Liech State. “Our country has been fighting for so long and we need to sing one song of peace. Speak peace and denounce violence as well as calling people to hold leaders accountable so that we can work together in monitoring the implementation on the peace agreement and go back home to stay in peaceful environment” said Nyuon. Minister Nyuon pointed out that in the next two weeks to come ta big peace disseminate celebration will be held in Leer capital. “We want to disseminate peace agreement to our citizens so that they will own peace implementation,” said Nyuon. He added that there were some changes from the civilians who left the country during the war in 2013. Those who were in the Internally Displaced Camps are now returning back home. The Minister revealed that last month twenty civilians returned from protection of civilians ‘sites. “We urged civilians who are still in refugees and Internally Displaced camps to come back home,” Nyuon said.